In recent times, uPVC has taken precedence in the window industry. Wood, iron and aluminium windows have been replaced with uPVC. Since uPVC is the latest trend which is here to stay in the industry. Many still wonder about what exactly is uPVC and how are uPVC windows made? Let us dig deeper to decipher what is a uPVC window and how are they made. uPVC is a versatile polymer and is based on polyvinyl chloride (PVC). The flexibility, equivalent durability and strength are what makes uPVC such a sought-after material to frame windows. Since uPVC is based on PVC, its PVC’s flexibility is leveraged through a unique formulation to prepare a special uPVC blend for windows. This is how uPVC is created. Now, let us understand what is a uPVC window? uPVC window is a versatile polymer created with polyvinyl chloride to create strong and sturdy uPVC window profiles, which are later fabricated together to form a uPVC window. They are extremely robust, low maintenance and can last for a long time. Hence uPVC windows have created a niche for themselves in the window industry. After dealing with what is a uPVC window let us move on to the next main pertinent question. How are uPVC windows made? The manufacturing process of uPVC windows begins with the preparation of a resin mix where higher levels of Titanium dioxide (TiO2) and lower level of Calcium Carbonate (CaCO3) to make the uPVC window profiles more durable and strong as well as resistant to UV rays. There is no use of lead-based substances in the resin mix to give the uPVC windows an environmentally friendly edge. To produce the uPVC windows there is a necessity of NABL accredited large-scale automatic mixing equipment which will ensure the mix to be churned the raw materials accurately and scientifically. Once the mix is ready, then the molten mix is entered into a die. The die is used to give the uPVC window profiles its shape as it is being pulled. They are cooled with a water bath. Once they are sufficiently cooled, packaging labels and protective tapes are put into the uPVC profiles. Then they are cut into standardized shapes for distribution. Later, these uPVC window profiles are framed together to form long-lasting uPVC windows. Hence this is the process by which uPVC windows are made. 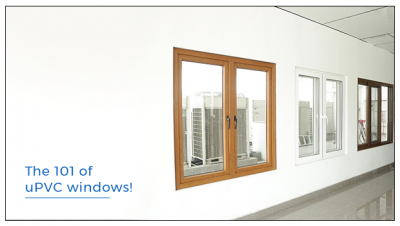 To get the best uPVC windows in the industry, explore https://aparnavenster.com/ .